Great Lakes freshwater condition throughout - Truly a floating cottage! 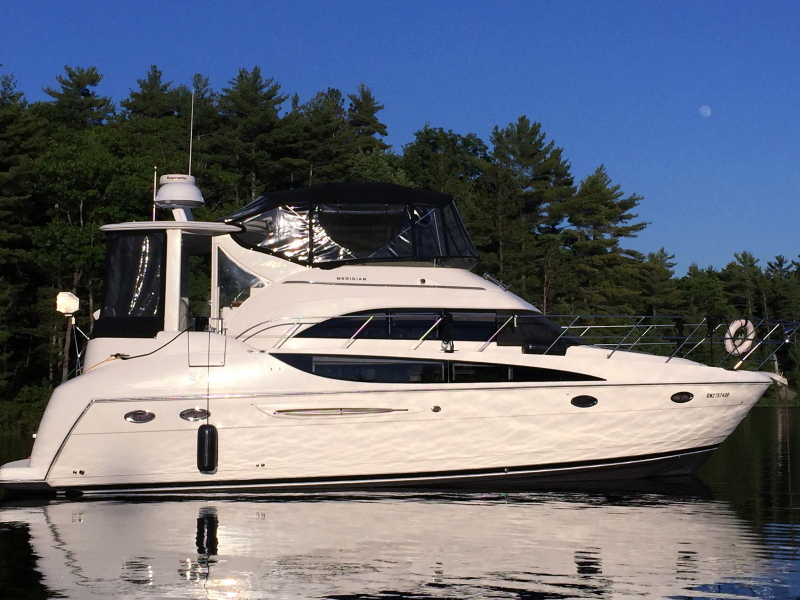 The Meridian 408 Motor Yacht is well suited for extended cruising with friends or family. Comfortable sleeping accommodations for four are provided via fore and aft staterooms with accommodation for two more in the salon. Ensuite heads for both staterooms ensure maximum privacy and comfort with the forward head accessible from the salon for day use. Large tiered windows in the full-beam salon provide great natural lighting and an exceptional panoramic view from the plush Flexsteel seating. On the bridge, a centre-line helm with single bucket seat provides great visibility, and two L-shaped lounges put the captain in the centre of activities. A refreshment center with sink, fridge and bottle storage makes entertaining guests a breeze. The aft deck area provides access to the swim platform, the bridge and the salon, as well as additional seating with a convenient wet bar and ice maker. The main salon/galley is a work of art with highly finished cherry wood cabinets and paneling throughout, recessed lighting, and neutral coloured upholstery that can easily fit with a wide variety of colour schemes. There is a large flat panel TV with surround sound opposite a Flexsteel leather lounge that converts to a double berth and comfy incliner seat. To starboard is a booth dinette with table and L-shaped Flexsteel seating with storage below. The galley is bathed in warm, natural lighting and features cabinets with sold-surface countertops, a 3-burner electric cooktop, a large refrigerator/freezer, built-in convection oven/microwave, and handy in-floor storage compartment. Galley flooring is easy-to-maintain teak-and-holly. The galley steps rise to reveal a utility room complete with a combo washer/dryer and storage shelves. Other major features noted: 50 amp/240V/60 cycle dockside power with Glendenning Cablemaster, 2000W inverter with a gel battery system, “Sturdy” engine synchronizer, 4-zone heat/air, 11.5kW generator and central vacuum. The entire battery system (11 batteries) was renewed in 2016 ($6000+), fresh bottom paint was applied and all gel coat above the waterline cleaned, waxed and buffed to a beautiful shine. With only 750 hours on the Cummins diesels, this absolutlely gorgeous, freshwater Merdian 408 is a rare find and sure to move quickly in the current market.